Posted on Tue, Mar 6, 2012 : 9:55 a.m.
A woman and an infant appeared to escape serious injury after a rollover crash on northbound U.S. 23 on the east side of Ann Arbor Tuesday morning, firefighters said. The crash at about 8:20 a.m. on northbound U.S. 23 north of Washtenaw Avenue caused major traffic delays on both sides of the freeway. The car ran off the road into the median and rolled over several times, said Capt. Craig Liggett of the Pittsfield Township Fire Department. Pittsfield firefighters were first to the scene, said Fire Chief Sean Gleason, but Ann Arbor Township firefighters handled the crash because it was in their jurisdiction. The driver and infant, who was buckled into a car seat, were taken to the University of Michigan Hospitals, but the infant appeared not to be injured, Liggett said. The driver was conscious and talking to rescuers at the scene, he said. The crash was the second rollover accident of the morning on U.S. 23. An earlier rollover crash occurred on southbound U.S. 23 near Plymouth Road, but no one had to be taken to the hospital, the Ann Arbor Township Fire Department said. 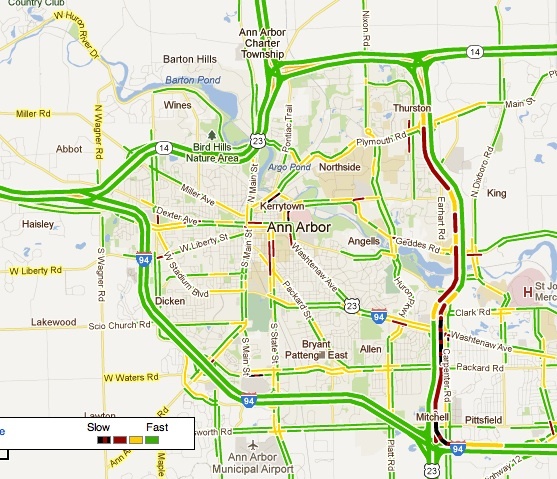 Both crashes had been cleared as of 9:20 a.m., a dispatcher with the Washtenaw County sheriff's department said. Traffic backups are shown in black, red and yellow. Tue, Mar 6, 2012 : 9:11 p.m. I still can't shake the feeling that there's something unusual going on with US 23, that highway seems to have a lot of serious (one vehicle) accidents, including the &quot;for no apparent reason&quot; kind. It's been this way as far back as when I moved here (that would be 1973). I've seen some really crazy things happen on US 23 &quot;in the vicinity of Ann Arbor.&quot; I'm glad the mother and child survived - apparently neither suffered major injury. Tue, Mar 6, 2012 : 5:23 p.m. I drove by just after the ambulance left. That car looked really messed up. Good thing it was a newer model; all of the side airbags had deployed. I'm sure that helped her survive. Any news as to the cause? Tue, Mar 6, 2012 : 3:50 p.m. Thank God! I saw the one at the M-14 split. The outcome is truly amazing. Tue, Mar 6, 2012 : 3:05 p.m. I saw this happen in my rearview mirror around 8:15am. I was in the left lane right where traffic merges from Washtenaw. I saw the car drive on a diagonal straight into the median and it flipped about 5 or 6 times. There wasn't anything strange about the traffic, roads were not slippery, just seemed out of the blue. My heart is still pounding. Fri, Mar 9, 2012 : 12:13 a.m. I know the driver. she did not get on at Washtenaw. She was in the left lane when a driver in the right lane moved into her lane and forced her into the median. Tue, Mar 6, 2012 : 6:03 p.m. I'm guessing she entered at Washtenaw. It looked like she went diagonally across the right and left lane and drove full speed into the median. I'm so happy to hear that the child and mother survived! Glad to be an automotive engineer today!! Tue, Mar 6, 2012 : 4:11 p.m. I was heading southbound on 23 right after this happened (at 8:22) and it was between Geddes and Washtenaw. Looked horrible, I'm glad the driver and baby appear to be okay. Definitely left me shaken. Tue, Mar 6, 2012 : 3:36 p.m.
Did it look like she had entered at Washtenaw? Glad you were in front of it and now behind it. Tue, Mar 6, 2012 : 2:39 p.m. The accident appeared to be major with three firetrucks and police cars at the scene. Saw a car that looked like it flipped over a few times with the airbags deployed. Hopefully the driver survived it.